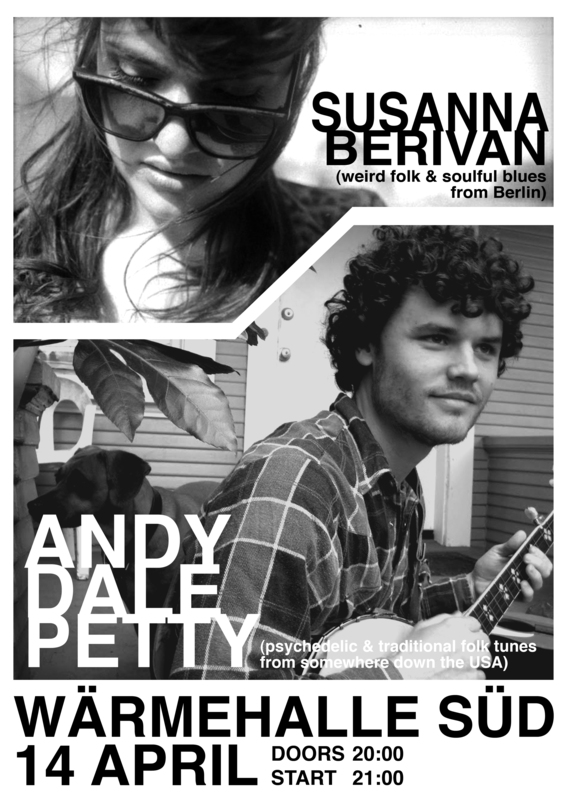 I proudly present an evening with the elusive ANDY DALE PETTY and the incredible but not uncredited SUSANNA BERIVAN. ANDY DALE PETTY is a MODERN FOLK SINGER a troubadour AMERICANA BLUE GRASS and multitalented songwriter in the tradition of BERT JANSCH, MISSISSIPPI JOHN HURT and WOODY GUTHRIE. “I met Andy Dale Petty in Huntsville, Alabama, he had a magazine in his pocket with all the state train routes in it and was telling me about how he loved to hop trains like the hobos back in the day. He taught me how to run next to a train and hop it, always make sure you can see the spokes in the wheel turning, if you cant than the train is too fast and you might lose a limb or two or your head. He fell asleep on a cold wooden porch that evening and then woke everyone up with his lovely geetar playing in the morning. Alabama is known as the place where the first confederate flag was designed and raised, incidentally it was also the place where the first rocket was made to take humans to the moon. Thankfully both slavery and moon travel were abandoned and replaced by white castle, waffle houses and welfare. People like Andy Dale make America the beautiful nightmare that it is. His guitar playing and hobosexuality preserve the fruits of the nation in a jar rather than a petri dish. He may not be able to turn water into wine but he can sure make a rainy afternoon feel like pickles and orange crush. The world would be a cold place without Andy Dale and his geetar, so if you see him by the train tracks, buy him a can of beans and throw a hotdog in it…. he deserves it.” – KING KHAN.